Scroll down to watch the live ceremony! 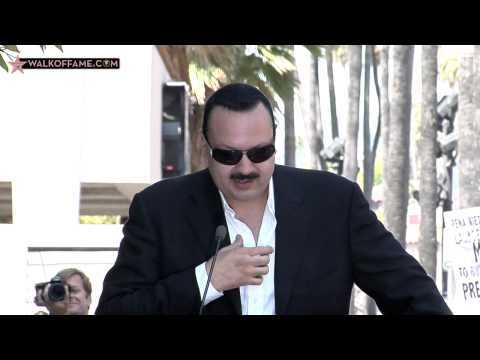 The Hollywood Chamber of Commerce proudly dedicated a Walk of Fame star today, July 26, 2012 for singer Pepe Aguilar. “Pepe Aguilar is one of the most popular Latin singing stars we have and it shows by the response fans have given us on a daily basis about the star ceremony. We also hear from his team that he is thrilled that his star is next to that of his father, the legendary Antonio Aguilar,” stated Ana Martinez, Walk of Fame Producer. Performing at the ceremony were Mariachi Zacatecano de Pepe Aguilar and Banda Sinaloense Viento de Oro. Along with family and friends. A sea of fans were on hand to see their favorite balladeer be honored with his star on the Walk of Fame. Emcee Leron Gubler, President & CEO of Hollywood Chamber of Commerce, guest speaker Neil Portnow, President & CEO of the National Academy of Recording Arts and Sciences® helped Pepe unveil the 2,474th in the category of Recording at 7060 Hollywood Boulevard in front of Live Nation Building. Pepe Aguilar was born on August 7, during his father Antonio Aguilar’s tour, in San Antonio Texas and was raised in Zacatecas Mexico. At the age of three he made his debut at no less a venue than Madison Square Garden in New York; the beginning of a singing career which, in his own individual style and manner, would also see him attain legendary status. However, in spite of the importance of this protective, familial tutelage, he developed his talents himself, leading a movement that would mix the mariachi tradition with the energy of contemporary pop music. With global sales of his recordings surpassing 12 million copies and hailed by critics in North America as a ‘Latin Music Superstar’, since the year 2000, among many recognitions, Pepe Aguilar has garnered four Grammys, and two Latin Grammys, thirteen Premios Lo Nuestro including his latest, ‘The Excellence Award’ last February and many Billboard Awards. The level of success Pepe Aguilar has achieved is also shown in the 15 songs that have reached the top of the Radio charts, and being a solid tour act for over 15 years. Apart from his exceptional voice (he is hailed as the “The Voice”, by many ), he is an accomplished producer/composer/musician. From "Miedo" and "El Autobus" to the most recent pieces "Ni Contigo ni sin Ti" and "Prometiste" who he co wrote and co produced. As a producer, he has worked with many renowned figures in the music industry, his entire family to start with, and a huge variety of artists, from traditional Mexican folk and pop singers like Lupita D’Alessio, Edith Márquez and Guadalupe Pineda to Spanish-language rock stars such as Julieta Venegas or Tiziano Ferro. His special commissions include the writing and production of the theme for the Premios OYE in 2005, for which he wrote an electronic song without lyrics. In the same year, he produced the theme for Teletón Mexico, which he sung with Sin Bandera, Reyli, Kalimba y Natalia, and La Forquentina, among others. His album credits include works with mariachi bands to symphony orchestras, “Mas De Un Camino” his latest work, was executive produced by him and complemented by the talented Fernando De Santiago, Homero Patrón y Manuel Cazares. “Mas De Un Camino” (More Than One Way), is the continuation of an earlier work, "Negociaré con la Pena" although more towards a traditional mariachi sound. This production, number 23 in the singer's successful career is composed of seven brand new tracks, with the participation of composers like Fato, Reily, Marco Antonio Solis, Estefano and Leonel Garcia among others. Earlier this year, his tribute/concept album "Bicentenario," won the Grammy, for “Best Regional Mexican or Tejano Album.” In addition, with this production he also won two Latin Grammy nominations for best album and best song with "Chaparrita," another one of his own compositions. Much to the joy of his fans, Aguilar will be performing at the Gibson Amphitheatre August 4th and 5th. Part of the criteria for being honored with a star is charitable involvement. Aguilar is proud to work with the Teleton Para Los Ninos and Padres Contra Cancer.